Inviting equestrian property with everything you need to to enjoy the Wellington equestrian lifestyle! 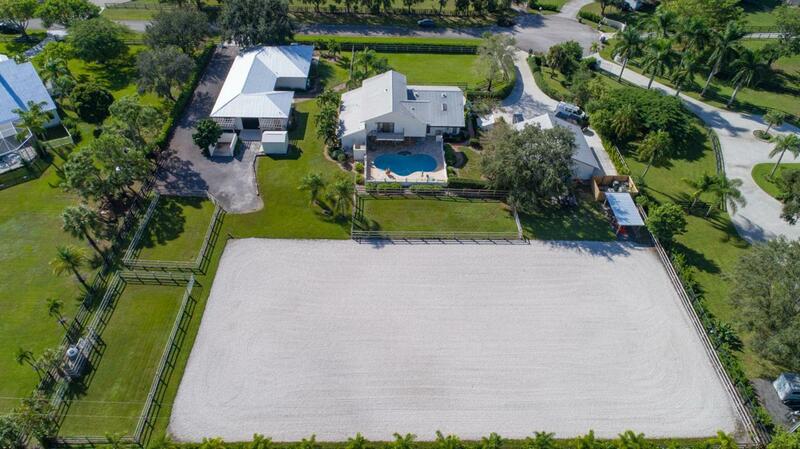 Located in the esteemed neighborhood of Paddock Park 2 on just under 2 acres, this farm boasts a 3,217 living sqft 4 bedroom, 2.5 bathroom pool home, a new 7 stall barn w/ great grooms accommodations, a detached 1,300 sq ft a/c'd garage/workshop, a large arena and paddocks. The two-story home features a beautiful open concept floor plan, vaulted ceilings and tons of natural light. The first floor includes 3 guest bedrooms, one full bath and one half bath, family room and a formal dining area. The charming kitchen offers granite countertops, stainless appliances, ample storage, an eat-in breakfast area as well as a custom wine bar with a wine cooler. Upstairs you will find a luxurious master suite with a balcony offering awesome views of both the pool and riding arena. A spiral staircase leads down to the enclosed patio that boasts a built-in grill, stunning travertine tile surrounding the free-from salt pool and spa. The 7-stall, commercially built, barn (completed in 2016 with fire alarm & sprinkler system) features a full bath, tack room with laundry, feed room and a lounge. Additionally, there is a 611 sqft large 1 bedroom, 1 bath apartment with a kitchen. There is rubber matting throughout, a fly spray system, security cameras, and fire alarm and sprinklers. The 216'x112' all-weather riding arena has full drainage in place with GGT footing. Notable extras include a whole-home generator, a 500 gallon in-ground propane tank, reverse osmosis water filtration for house and barn, security alarm & cameras and salt water pool with spa.